Gate closers are among the most integral but often overlooked examples of hardware, and at Barrier Components we have designed and developed a wide range of fittings to meet our consumer’s needs. We stock both metal and timber gate closers, with our products available in all shapes and sizes for both light and heavy duty gates. 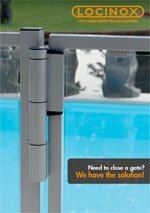 Take our adjustable tension spring hinge for light duty gates, which is ideal for fittings surrounding swimming pools and other potential hazards. We also sell an all new TruClose heavy duty hinge that has been designed to suit larger gates that weigh up to 70kg. All of our products are available in pairs, so you can buy your gate closers with us and make the most of our comprehensively stocked, one-stop shop. With this in mind, feel free to get in touch today and make contact with our knowledgeable team. Locinox have launched a new 6 page catalogue with details about their full range. Click below to download.